Though this shift in culture affected how I saw almost all media, somehow that vision didn't extend itself to games. It wasn't until some months later when I was testing a build of a game on that tiny island that it arrived on my radar: "Brenda, why aren't there any black characters in games?" It was one of the silliest questions I'd ever been asked, right up until I drew a blank. I blanked for a long time. Was it because I was racist? Was it because the people on my team were racist? No. It was because the characters in the games were an accidental reflection of the world in which the developers lived and worked. There were no black people in the game for the same reason there were no white people in the paper that day in Barbados. 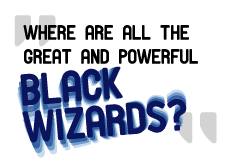 I paused to wonder, "Where are all the great and powerful black wizards?" When game diversity evolved, and it sort of did, it did so rather tragically with the invention of the "brown slider." Using the brown slider, you could turn any white character into a person that was enigmatically brown. The diversity problem had been solved. Light brown = Asian, medium brown = Latino, dark brown = black. Everyone went for it except people who actually were a shade of brown. Not surprisingly, they didn't feel a kinship with these new darkly tinted white characters. Next came the enigmatically brown characters with indistinct facial features that probably are not white but don't belong to any other race either. It met with about as much success. "I feel like I am different from the game characters when a game allows you to create your own characters but doesn't have the right skin tone or voice that fits you," says Kevin Powell, an undergrad studying game design at the Savannah College of Art and Design. "I usually try to identify with the characters in the game, because I know that all these characters weren't created to be just like me." In other words, Kevin takes what he can get. But it doesn't have to be this way. If a game is supposed to be about abdicating authorship and allowing people to become one with the game world, it would be excellent if the Kevin Powells of the world could share in that experience, too. "I just do not understand how I can make a unique black character when the only hairstyle I can choose from is an afro or corn rows," he continues. "I mean, sure they have a crew cut, but it just doesn't look natural when applied to the one shade of brown that remotely matches my skin tone. Over the years, it has gotten better, but I still just don't feel like I can make a black character as diverse as I would be able to make a white character."